Much has been written about the pain and dreariness of tackling weeknight dinners, but this is not one of those articles. This is a guide to 14 items that you should have on hand at all times so that when you finally disengage yourself from the demands of the day to focus on dinner you have a running head start. Whether it’s a family dinner on a school night, or quick meal for one, or just the need to not have to go out to the grocery store one more time, these pantry staples will enable you to get dinner on the table any night of the week. In a perfect world, you’ll have both kinds on hand, more if you are interested in a variety of levels of flavor. For most savory food, except for Asian food, this is the kind of oil to use. Weeknight meals at their simplest could be a piece of chicken, meat, or fish pan seared or sautéed in olive oil, seasoned with salt and pepper. 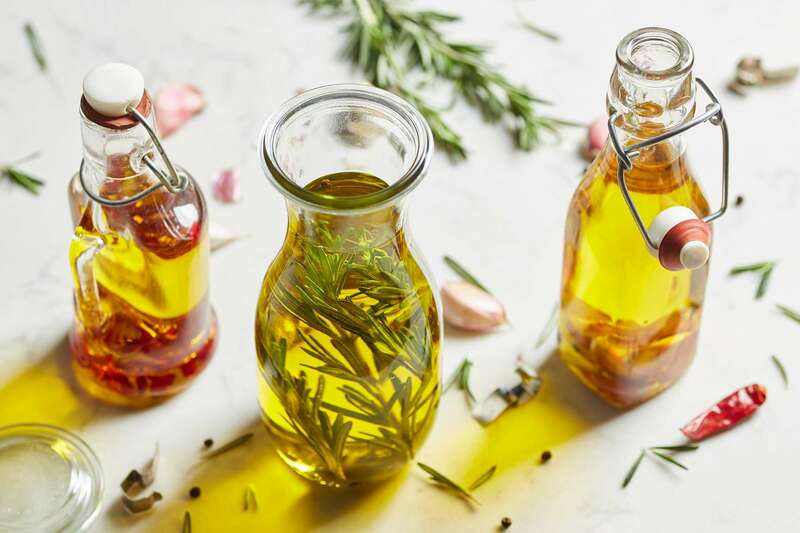 You can use pure olive oil for cooking, saving the more pricy extra-virgin for uncooked dishes, like salad dressings or drizzling over tomatoes and the like. There are tons of brands out there, and you should play around since some have a much more pronounced flavor, some are fruitier than others, and so on, and find ones that you really like. Also, there are some good quality extra virgin olive oil available in large bottles at the supermarket that won’t break the bank, inexpensive enough to cook with, if you’re only buying one kind. If there is one seasoning you always need to have on hand, it’s salt. Almost every recipe, whether savory or sweet, calls for salt to bump up the flavor. Kosher salt has a much larger grain size than common table salt, and no additives, which can make salt taste sharp or harsh. You may also prefer sea salt, which sometimes has an even coarser texture; You should avoid salt that is too coarse, or you’ll be crunching chunks which is not so pleasant. You also may want to experiment with some other fancy salts, like Fleur de Sel, Maldon Sea Salt, or some of the Hawaiian varieties, but make sure to save those for sprinkling on at the end of a dish. They are expensive, so you’ll want to use them sparingly, and their subtle flavors will get lost if you use them in cooking. The onion family includes garlic, leeks, onions, shallots, and scallions, and practically every savory dish includes one or more of these – at least in my house. In short, the onion family, whether cooked or raw, provides a flavor base for almost any kind of dish, no matter what the ethnic orientation. With any of these items, raw the flavor is sharper, cooked it becomes more mellow and sweet. It’s hard to think of another ingredient that has a place in so many dishes and cuisines. At the very least buy onions and garlic. Even if a recipe calls for shallots or scallions or leeks, you can improvise with onions and garlic if you want to. If you have olive oil, salt, and a member of the onion family, you are well on your way to a flavorful weeknight meal. Pick a protein, sauté it up with some minced garlic or onion, and you have dinner. A little bit in everything from salad dressing to dips to tuna fish to macaroni and cheese turns to pan sauces things from blah to not blah very quickly. Even if your family is not a mustard family, when used as an ingredient in various dishes it elevates the flavor much like salt or pepper or soy sauce. You can use smooth or coarse ground, or if you fall in love, buy both so you can vary things up. Mustard is made from the seeds of a mustard plant, and the seeds can be used whole, ground, cracked, or smushed. The seeds are then mixed with water, salt, lemon juice and maybe other liquids and seasonings to create a paste. Dijon mustard also includes wine or vinegar or both for that identifiable tang, and is the mustard I most use in cooking. Just a spoonful of soy sauce. Getty Images / Maximilian Stock Ltd. Indispensable in all things Asian, (and kids on the whole seem to really like the basic flavors of Asian food), but also interesting as an ingredient in recipes that aren’t particularly Asian in tone. It can be used in cooking, and as a condiment. Soy sauce is produced by fermenting soybeans along with water and salt, and often some sort of grain. The fermented soybean paste is then pressed, to extract the liquid soy sauce. It’s is a traditional ingredient in East and Southeast Asian cuisines, and the base of teriyaki sauce, but it can add a pop of flavor and a rich saltiness to all kinds of dishes if used sparingly. I use less-sodium soy sauce on a regular basis, because you still get the rich flavor, but with less salt. You can dilute regular soy sauce to cut back on the salt, using a 2/3 soy sauce to 1/3 water ratio. La Morena Chipotle Peppers in Adobo Sauce. Chipotles in adobo sauce are smoked jalapeno peppers which have been stewed in a sauce with tomatoes, garlic, vinegar, salt, and various spices such as cumin, oregano and paprika. Imagine doing all that yourself! Now imagine pureeing a little 7-ounce can of the peppers and sauce, transferring it to a plastic container, then tucking it into the fridge and scooping out teaspoons whenever you need it. This condiment will last for a couple of months, and you will use it again and again, until it’s all gone, and you do it again. It lasts for weeks upon weeks, and you will fall in love with its smoky, sultry taste. This condiment is used frequently in Mexican and Mexican-inspired cuisines. To summarize: a little bit of puree = nice flavor, not so much heat; a lot of puree = a lot of flavor AND heat. The real stuff puts anything you can buy in a can to shame. Parmesan is a hard granular cheese, made from raw cow’s milk, produced in Italy, but the term Parmesan is also used for cheeses, which are made in the style of Parmigiano-Reggiano. Freshly grated Parmesan is a central ingredient in dishes such as macaroni and cheese or risotto, a topping for pasta, and an integral ingredient in chicken or eggplant Parmesan, but a little bit sprinkled on a salad or a soup or a pizza or mashed potatoes offers an extra hit of flavor and a bit of saltiness. In a perfect world, you’ll buy a nice big block and grate it yourself as needed. In a more real world, you might buy the pre-grated Parmesan, but still, go for the good stuff at the cheese counter or a specialty store. A super simple weeknight dinner might be some chunky pasta shape simmered with broccoli florets in some chicken or vegetable broth, and finished with a generous shower of Parmesan. There are different schools of thought on storing Parmesan cheese so it doesn’t get moldy, but one good method is to moisten a piece of cheesecloth or a paper towel and wrap it around the cheese, then wrap the whole thing in aluminum foil and store it in the crisper drawer of your refrigerator. The foil allows just the right amount of air to circulate around the cheese, and it should keep for months. These are available in many varieties, whole (in puree or juice), crushed (in puree of juice), pureed, sauce, diced, and more. You can buy them whole and cut them up yourself, or go for the pre-pureed/diced/crushed versions to save time. Sometimes you can find crushed tomato in puree vs. juice, which makes for a thicker sauce. You may have heard about San Marzano tomatoes, which are from Italy, and extremely flavorful because of the unique soil and environment they are grown in. They are pretty fantastic, and so are other tomatoes, which are grown in nearby regions (but can’t be called San Marzano because they aren’t grown in that exact region). San Marzanos are more expensive than your everyday canned tomato, but worth the splurge when you are making something for a special occasion. They usually come whole, though, so you have to do any crushing or dicing or pureeing yourself. To make a quick homemade tomato sauce, sauté some garlic or onion in olive oil, add dried basil and oregano, some crushed or pureed canned tomatoes with their juice and season with salt and pepper. Simmer for 25 to 30 minutes, or longer for a more concentrated sauce, until the house smells great. Also add canned tomatoes to soups, beans, stews, pot roasts, rice dishes, and chili. These are some of the hardiest vegetables around, lasting for more than a week in the refrigerator, substantially more in the case of carrots. Added to pasta they turn a starch into a vegetarian meal, and they can also be cut up and tossed with a little olive oil and salt, then roasts in a hot (450° F) oven for 40 minutes or so until they become tender and caramelized. You can also sauté them, steam them, and add them chopped to stir fries, pasta salads and skillet dishes. This is sort of a “no, duh” thing to include, but it is in fact one of those life-saving items to always, always (one more time, always) have in the house. If you have a box of pasta, you will almost definitely be able to get dinner on the table from whatever you have in the fridge or in your pantry. And pasta also = casseroles, macaroni and cheese, skillet meals, and so forth. When you find a brand you love, and it goes on sale, this is another great item to stock up on. The pantry life of pasta is years long. Think about different shapes for different dishes. Small pastas for soups and stews, long skinny pasta for thin sauces, chunky pastas for pasta salads and casseroles and thick and meaty sauces. If you have kids, let them help pick different shapes – you can freshen up a favorite recipe quickly and easily just by changing the shape of the pasta. Also, give whole grain pasta a try; it’s certainly a simple way to get more whole grains into your world. If you like to cook Asian food, make a stop in a local Chinatown or Asian specialty market, or at least stroll down the Asian aisle in your supermarket to see what different pastas are available. Wheat-based Asian noodles have a different consistency than most Italian noodles, often more delicate, and you’ll also find noodles made from rice flour, bean curd (cellophane noodles), or buckwheat flour (called soba). Follow the cooking directions on the package (and also look for quick easy recipes on the packages, too). Fresh pastas are also great to have on hand in the fridge, though their shelf life is considerably shorter. However, you can keep a package of fresh pasta or perhaps fresh ravioli in the freezer for several months for a quick dinner. The texture and flavor is lovely and delicate. Here is a low fat, vegetarian protein that stores for years, can be used in so many different ways and cuisines, and is very economical on top of all that. Dried beans also last for a long time, and are even cheaper, but in most cases you do have to plan ahead to soak and cook them before using them in recipes, so they are less of a last-minute help. Garbanzo beans (chick peas): great for salads, soups, stews, curries, or pureed in dips and spreads. Often used in Indian and Mediterranean dishes. Black beans: Used in many Mexican and Cuban dishes, chilies, soups, stews, and often the star of black beans and rice. Kidney beans: often found in Southern and Mexican preparations. Great in soups and chilis. Cannellini beans: Found in Italian dishes, soups, stews, side dishes, lovely with meats. Navy beans: a white bean, good in baked bean dishes, soups, stews. Pinto beans: These get their name for its mottled skin (compared to a pinto horse). These are actually the most common bean in the United States and northern Mexico, eaten frequently in soups, burritos, as the bean featured in refried beans. Also popular served with rice, or used in chilis. A very quick weeknight Mexican “lasagna” can be made some layers of flour or corn tortillas (another good refrigerator staple), drained canned beans, tomato sauce, salsa, and shredded cheddar or Monterey Jack, all stacked up in a cake pan or casserole. Bake at 375°F until everything is golden brown and melty. You can add in anything else you have on hand from shredded chicken to canned artichoke hearts. 5-4-3-2-1-dinner. Stretch leftover brisket into a soup by simmering it with barley in some broth. Chop up every vegetable in the house and simmer them with some rice in a pot of broth until it turns into soup. Sauté some rice and cubes of pork or chicken in oil, pour in chicken broth instead of water, and create a simple stovetop skillet meal. You can use broth in place of water in most savory cooking, and get results with more flavor and interest. Even steaming vegetables over broth infuses them with extra flavor. And if you have leftover cooked chicken and a package of noodles, and maybe some carrots to slcie and some dill, a carton of broth turns into chicken noodle soup in a flash. Canned or boxed broths are great, and have a substantial shelf life. A box of bouillon cubes is also good to have on hand in a pinch, and there are also some stock pastes that keep in the refrigerator for months, which can be diluted with water into broth, and take up very little space. You may want to keep an assortment of beef, chicken, and vegetable stocks around for different purposes. Go for the lower sodium if possible, since many of these broths and stocks do pack a salt wallop. These are available everywhere from price clubs to supermarkets, even organic versions. You pay a little extra for the individual wrapping, but having an easily defrost-able set of chicken breasts in your freezer is worth any price on a harried weeknight evening when a stop at the supermarket just isn’t in the cards. If you transfer them to a plate, still in their wrappers, and put that plate in the refrigerator in the morning, they should be mostly defrosted by dinner time (and the rest of the defrosting can take place as you cook them, just add a few extra minutes of cooking time). Baking and grilling are fine ways to cook a chicken breast, but cooking chicken breasts in a skillet with minced onion or garlic, and then making a simple pan sauce is a great weeknight technique. When the chicken breasts are cooked, set them aside, then add some wine or chicken broth or both to the skillet and scrape up any brown bits stuck to the bottom, which will add flavor to your sauce. You can then add some Dijon mustard, fresh or dried herbs, maybe a splash of vinegar or citrus juice, and when the liquid has thickened slightly, pour the pan sauce over the chicken breasts. You can vary the sauces with whatever you have on hand. Also, if you have some leftover salsa, or a dip, or some pesto or tapenade, you could also spoon a dollop over a plain chicken breast. Open that fridge door wide, and you will certainly find a bunch of ways to dress up that plain chicken breast. A dozen eggs equals dinner any day of the week. Cheap, protein-packed, versatile, vegetarian, eggs are a miracle food, and not just in the a.m.
Poached, fried, in an omelet, frittatas, scrambled up all plain and simple, or try them with some of these add-ins. The amounts are for six eggs, which usually feed two to three people. Because you’re making scrambled eggs, and not an omelet, feel free to stir ingredients right into the beaten eggs before adding them to the pan. Don’t hesitate to mix and match the ingredients. The fun is in creating your own masterpiece, and if you have kids, encourage them to start concocting their own egg recipes – this is a very good place to light the creative fire in the kitchen. Cheese scramble: Add 2 to 3 tablespoons of shredded or crumbled cheese, such as mozzarella, cheddar, Monterey Jack, goat cheese, feta, even American—just about all cheese works beautifully with eggs. Fresh herb scramble: Stir in about 1 teaspoon of minced fresh herbs. A little bit will add a lot of flavor. Dried herb scramble: Mix in 1⁄4 to 1⁄2 teaspoon of dried herbs, such as oregano, thyme, marjoram, and basil. Meat scramble: Add 1⁄4 cup of crumbled cooked bacon or sausage (watch any added salt if you use one of these salty meats). Vegetable scramble: Mix in 1⁄4 to 1⁄2 cup chopped or shredded vegetables, such as chopped tomato, zucchini, summer squash, or shredded carrot. Vegetables like broccoli or asparagus should be lightly cooked first. Mexican scramble: Try a medley of cheeses, a pinch of chili powder, slivered scallions, maybe a couple of tablespoons of kidney or black beans, and a bit of cooked corn. Top the cooked eggs with a spoonful of salsa and sour cream. You might even wrap the whole thing up in a flour tortilla and create a dinner/breakfast burrito. Italian scramble: Beat in a couple of slivered fresh basil leaves (or 1⁄4 teaspoon of dried basil), 2 tablespoons of shredded mozzarella and/or Parmesan cheese, and maybe a teaspoon or two of some chopped fresh or sun-dried tomatoes. You can serve a dollop of pasta sauce on the side if you like. Indian scramble: A pinch of curry powder and cumin are very interesting in eggs. Serve the scrambled eggs with a spoonful of chutney and plain yogurt or sour cream (or stir some grated cucumber into the yogurt or sour cream).